Last year, Kody Clemens used his bat to contribute to Texas’ run to the NCAA baseball tournament. He’ll add his glove to the mix this spring. Texas opens its season in three weeks, at home against Louisiana Lafayette. On Friday, Longhorns coach David Pierce said he’d start Clemens at third base if the season started this weekend. The infield would be filled by shortstop David Hamilton, second baseman Masen Hibbeler and first baseman Ryan Reynolds. Clemens, a junior, recorded 170 at-bats last season when he was primarily used as a designated hitter. He hit .241 with five home runs, 23 RBIs and 21 runs scored. Clemens was limited to a few reps at second base as he recovered from Tommy John surgery. On Friday, he bemoaned the in-game down time he’d have as a DH. 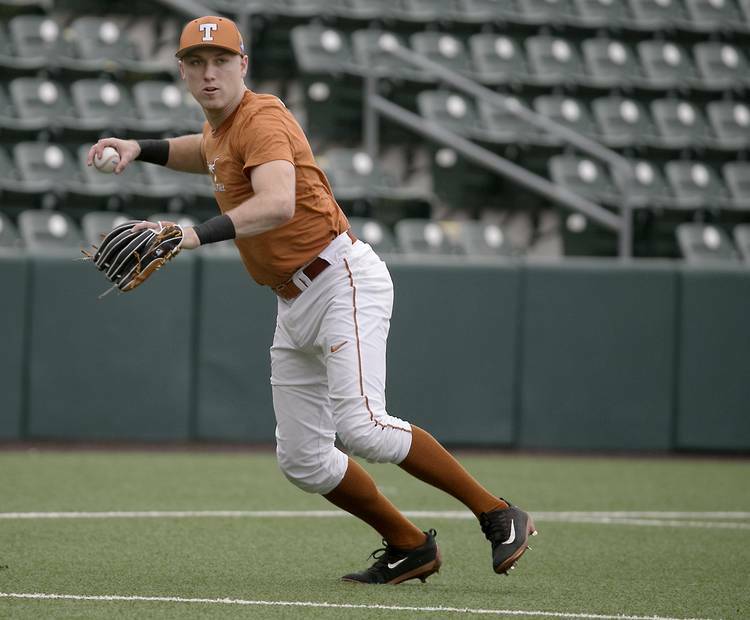 Clemens, who said he felt fully healthy toward the end of last summer, hasn’t played third base since his freshman year, but he made highlight-reel plays at the position in last fall’s Orange-White World Series. He’ll rejoin a defense that was among UT’s strengths in 2017. The Longhorns ranked fourth nationally with their .982 fielding percentage. Hamilton and Reynolds, who was UT’s third baseman last year, are the only holdovers in the infield. Clemens, who also expects to take on more of a leadership role with the Longhorns, met with the media two days after the announcement of the Baseball Hall of Fame’s 2018 class. Clemens’ father, Roger, appeared on 57.3 percent of the ballots but fell well short of the 75-percent threshold needed for induction. In 2017, he received 54.1 percent of the vote. On paper, Clemens is a sure-fire candidate for the Hall of Fame. The Longhorns legend won 354 games over 24 MLB seasons and was a seven-time Cy Young Award winner. His alleged use of steroids, however, has handicapped his candidacy, which is in its sixth year. Kody Clemens said he did not watch this week’s live announcement of the 2018 class. He added he didn’t think it was on the top of his father’s mind, either. Clemens did, though, express optimism that his dad would one day get his bust in Cooperstown. Around the bases: Texas announced that the Feb. 3 alumni game will start at 2 p.m.. Fan Appreciation Day activities will begin at 10 a.m. … Clemens said his older brother Kacy will play in the alumni game. Kacy Clemens, who led the Longhorns last year in most offensive categories, was drafted by the Blue Jays last June. … Texas is ranked 20th in USA Today’s preseason poll. UT went 39-24 in 2017.